Early Thursday, 10 August 2017, the state-run media KCNA announced that the North Korean Strategic Force of the Korean People's Army (KPA) is "seriously examining the plan for an enveloping strike at Guam through simultaneous fire of four Hwasong-12 intermediate-range strategic ballistic rockets in order to interdict the enemy forces on major military bases on Guam and to signal a crucial warning to the US ..."
A few hours prior, on Wednesday 9 August, the US State Department's Spokesperson, Heather Nauert conducted a press briefing. What follows is a partial nonverbal analysis of a portion of that briefing - concentrating on Donald Trump's "Fire and Fury" comments yesterday regarding North Korea's nuclear threats. JOURNALIST (beginning at 4:04): Thanks Heather. Um, so, i-, in the President's remarks and then in the Secretary's, um, ah, comments about the President's remarks, um, saying that it was the kind of language that, that North Korea would understand, and almost in a way - 'diplomatic-speak' - is that something, is that an approach the State Department was involved in? That the President took yesterday? HEATHER NAUERT: Ah, the State Department, um, the President, the Secretary, and the President have ongoing conversations. Ah, they spoke earlier today. Ahum, this pressure campaign - with North Korea is something that we are all in agreement on. Folks in the US government are all in agreement i-, on. So, nothing, nothing has changed in that regard. Note during 4:16, as the journalist says, "... understand ...", Ms. Nauert inhales deeply. This, in itself, is a nonspecific, general anxiety indicator. However, just two seconds later we see an outstanding example of a microexpression. Microexpressions are all, of course, very evanescent - and yet they come in many varieties. This particular one was in the form of a blink, followed by a sudden raising and lowering of both eyebrows (4:18 as the Journalist says, "... is that something ..."). Some refer to this as an "Eyebrow Flash" (Please watch this section of the video several times - as it is quite brief and must be observed in the dynamic context of motion). 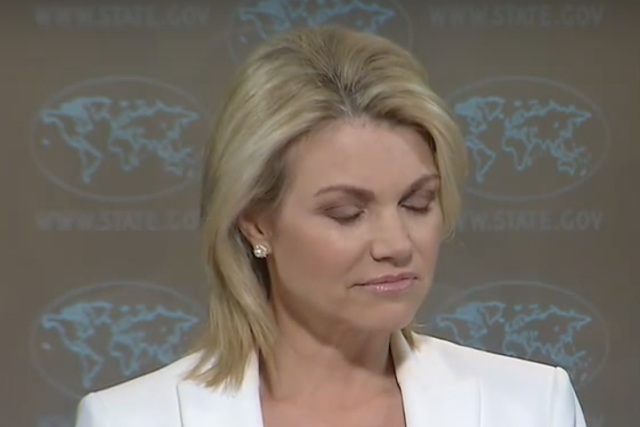 In this cluster-context, Ms. Nauert's eyebrow flash immediately following the journalist saying Rex Tillerson's assessment of Donald Trump's "Fire and Fury" statement is "Diplomatic-speak", indicates that she is in dramatic disagreement. 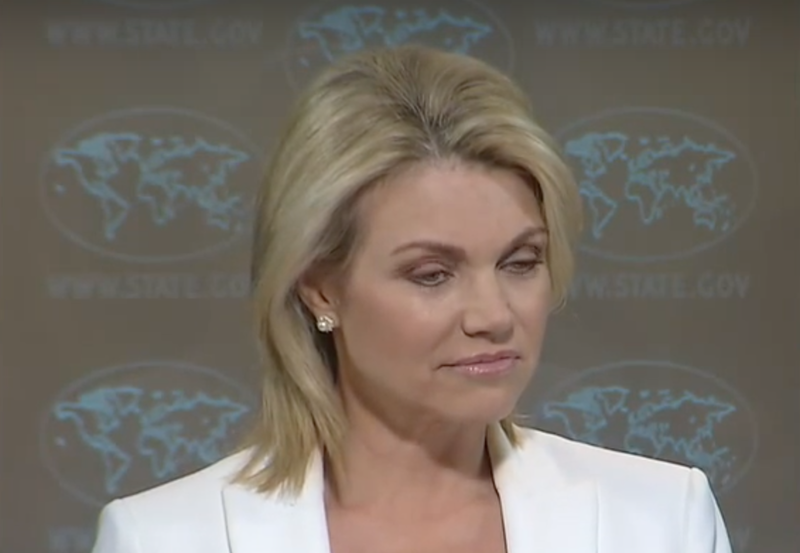 Summary: US State Department spokesperson, Heather Nauert, does not at all believe that President Trump's "Fire and Fury" statement was diplomatic.